The popularity of tattooing during the late 19th century and the beginning of the 20th century owed much to the circus. When circuses prospered, tattooing prospered. When circuses went bankrupt, tattooed people and artists were out of work. For over 70 years every major circus employed several completely tattooed people. Some were exhibited in sideshows, other performed in traditional circus acts such as juggling and sword swallowing. Rival circuses competed with each other for the services of the most elaborately tattooed show people and paid them handsome salaries. Many of the old-time tattoo artists made most of their money while traveling with circuses during the spring and summer, returning to their shops and homes in the winter. The circus served as a showcase where tattoo artists could attract customers by exhibiting their work to a paying public, and in many cases the only surviving records are in the form of photos and posters which were used for circus publicity. The connection between tattooing and the circus began in 1804 when Jean Baptiste Cabri who had been tattooed by the Marquesas became a carnival performer. In the last years of his life he was forced to compete with trained dogs and other popular amusements in country fairs. By 1822 he died, poor and forgotten. The first tattooed English showman was John Rutherford. It was said that he was captured and held prisoners by the Maoris. 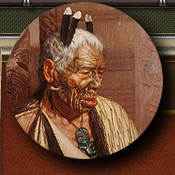 During his years with the Maoris he participated in warfare, headhunting, and other tribal activities. When he returned he accompanied a traveling caravan of wonders where he showed his tattooing, and told of his adventures. The great 19th century showman, Phineas T. Barnum, is credited with organizing the first group exhibitions of unique individuals. One of the principal attractions at Barnum's American Museum in 1842 was James F. O'Connell who had the honor of being the first tattooed man ever exhibited in the United States. He entertained his audiences wih tales of exotic adventures and according to O'Connell, savages on Ponape, in the Caroline Islands captured him and forced him to submit to tattooing at the hands of a series of voluptuous virgins. He was forced to marry the last one who tattooed him. Museum patrons, most of whom had never seen tattooing before, were impressed. The railway in 1869, connected the east and west coasts of the United Sates. The circus entered a period of growth and prosperity that resulted in employment opportunities for many tattooed people and tattoo artists. Constantine, a Greek who had spent many years in Burma, had himself tattooed with the intention of going into show business. He was the most elaborately and artistically tattooed performer of his time. He said that four strong men had to hold him down while he was tattooed every morning for three hours. It took three months for the work to be completed. With the invention of the electric tattooing machine, many individuals were attracted to the opportunity of making an easy living in the circus. "La Belle Irene" made her London debut in 1890, claiming to be the first completely tattooed woman ever exhibited in a circus. Her decorations included an assortment of flowers, birds, hearts, cupids, scrolls and sentimental inscriptions borrowed from the ornamental commercial art of the day. Londoners were told that she received her tattoos as protection in a savage land (Texas) as a protection against the unwelcome advances of the natives. During the last decade of the 19th century, the circus enjoyed an unprecedented period of growth and prosperity. As circuses prospered, the demand for tattooed people increased and the competition became intense as circus owners competed to come up with more extravagant tattooed shows. There were tattooed sword swallowers, fire eaters, dwarves, jugglers, mind readers, strong men, fat ladies, wrestlers, knife throwers and even circus animals. It has been estimated that by 1920, over 300 completely tattooed people wee employed in circuses and sideshows. Some earned as much as $200 a week. 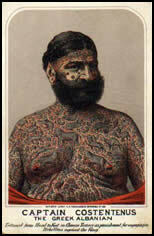 The most famous tattooed man of this period was Horace Ridler. In 1927, he asked London's leading tattoo artist, George Burchett, to tattoo him all over, including his face with inch-wide zebra stripes.